Sometimes it’s easier to be invisible in a small town than a big city. 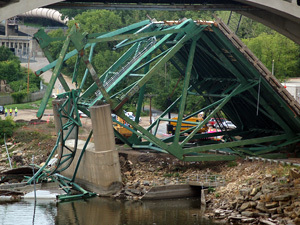 The Star Tribune this week unveiled an online portrait of the victims of the I-35W bridge collapse. Thirteen seconds in August used a photo of the vehicles strewn about the wreckage, linking the vehicles to the compelling stories of their owners. Only one construction worker made it into the presentation. Eighteen construction workers rode the bridge to the ground and the water that evening. One — Greg Jolstad — died. After the disaster, many of the workers helped rescue the victims. Then some became invisible, even in their own community. Two surfaced today in the West Central (Willmar) Tribune (reg possibly required): Hector Bustos Peralta and his nephew Luis DelReal. Their stories are heart-breaking, compelling, and sure to cause Willmar residents to wonder how they didn’t know they were there. Their neighbors in southeast Willmar have helped with the children, but most people in Willmar have not known about the family’s situation. A cousin asked people at St. Mary’s Church to pray for someone who was on the bridge that day, but most people didn’t know they were praying for Hector, Abigail said. They recently ran into a friend who was surprised to see Hector using a cane and asked what had happened to him. Diaz, a community organizer for the Races Project, said she had been surprised to hear about the family only recently. “I feel bad that, as a community, we didn’t know,” she said. On Thursday, the state made its move to provide some short-term help to the victims, with the suggestion that more help would be provided… later. But on Friday, the state budget forecast put some lawmakers, like Rep. Marty Seifert, in a budget-cutting mood. Hector, Luis and other victims are about to get caught up in another mess.